Under the Charities Act 2011 (and its predecessors), a person can be automatically disqualified from acting as a charity trustee if they have committed certain offences or are in circumstances that Parliament has decided are incompatible with charity trusteeship. For instance, a person who has been disqualified from being a company director is automatically banned from being a charity trustee. The Charities (Protection and Social Investment) Act 2016 (the Act) expanded the list of offences and circumstances leading to automatic disqualification. Furthermore, the Act provides that anyone who is automatically banned from acting as a trustee is also ineligible for employment by a charity in a role with "senior management functions". The Government chose to delay the introduction of the expanded regime, to give charities (and individuals) that might be affected an opportunity to prepare themselves for the changes. 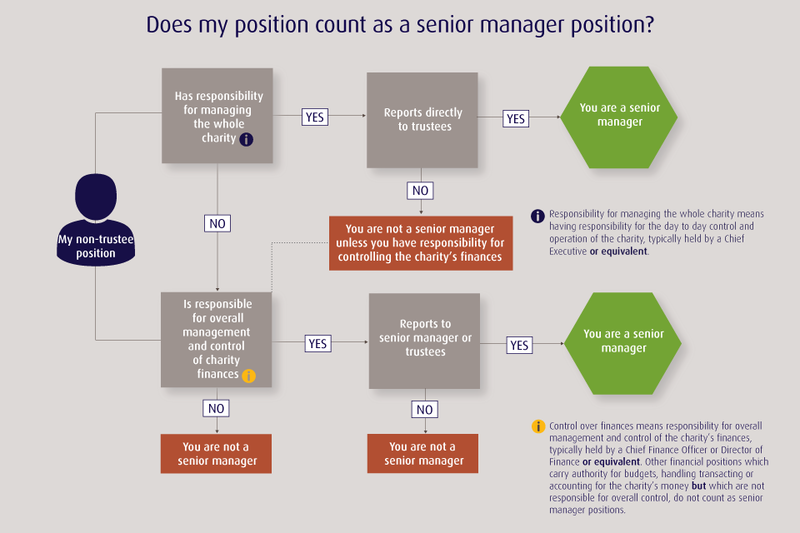 to hold senior manager positions only at any charity (this is a general waiver and if it is given, disqualification from acting as a trustee remains). On 1 August 2018, the longer list of disqualifying circumstances will come into force. What should charities do to prepare for the changes? The first two sections contain only a brief outline of the law, but they link to fuller guides on the matters that lead to automatic disqualification and on what constitutes a role with "senior management functions" . The main recommendations on how to prepare for the changes are for charities to (1) check and update the procedures they have for ensuring trustees and senior managers are entitled to hold their positions, and (2) ask prospective and serving trustees and senior managers to sign a declaration that they are not disqualified from acting. The Commission plans to produce a model declaration for charities to use. It suggests asking trustees and senior managers to sign fresh declarations "at reasonable intervals" and advises trustees to check various official registers to see whether trustees and senior managers are listed. For this purpose, the guidance provides links to the Insolvency Service website (for bankruptcies and individual voluntary arrangements), Companies House (for director disqualifications), and the Commission's own register of people who have been removed from trusteeship. In recognition of the potential employment disputes that may result from a senior manager having to leave, the Commission recommends that charities review their employment contracts, to ensure they will be protected in such circumstances. The guidance goes on to advise trustees on what to do if it turns out that a trustee or senior manager will become disqualified in August. They should consider whether any trustee departures will leave enough members on board to form a quorum; in the case of senior managers, they should look at the employment rights of the individual concerned. whether the trustees have assessed and can manage any risks associated with appointing (or maintaining the appointment of) the applicant. The Commission points out that it will not be able to grant a waiver where an applicant is prevented from acting due to other legislation or because of a provision of the charity's governing document. For example, it is common for charity governing documents to prohibit undischarged bankrupts from acting as trustees; legislation also prevents bankrupts from being trustees of charitable companies or CIOs. In separate guidance – Automatic disqualification: Waiver decision process and appeals – the Commission describes its approach to considering waiver applications. This contains two lists: factors that make disqualification more likely to be waived, and factors that make waiver less likely. The bottom line is whether granting a waiver will be in the best interests of a particular charity or charities, class of charities, or charities in general. An application for waiver in respect of a specific charity or charities is more likely to be successful than an application for waiver in relation to a class of charities or charities generally. On 1 February, the Commission put out a news story with the heading "Charity automatic disqualification rules: you can now apply for a waiver". Applications can only be made online – the form is here. The Regulations state that anyone who has applied for a waiver but not yet had a reply from the Commission will not become disqualified once the new rules come in on 1 August. Nor will anyone whose application has been refused but who has not yet reached the end of any appeal process. Nonetheless, we recommend that you take action early to prepare for the change in the law, even if you consider it unlikely that your charity will be affected. Essentially, it means Chief Executives and Chief Financial Officers, but whether or not a person is a senior manager will depend on their position and functions, not their job title. In its guidance for individuals concerned that they may be facing disqualification, the Commission provides a fuller explanation of the term and a downloadable flow chart. If you have any questions about the forthcoming changes or are concerned that your charity's employment contracts may leave you exposed if a senior manager is required to leave, please contact us for advice.